This Instant Pot Whole Chicken recipe can be made with fresh or frozen chicken! It is moist, juicy and so much easier than roasting! Slathered in garlic butter and cooked to perfect in your pressure cooker in just 30 minutes. This Instant Pot Whole Chicken, you guys. So easy. Sooooo juicy. I know, you probably all saw this happening. The Instant Pot is winning me over. 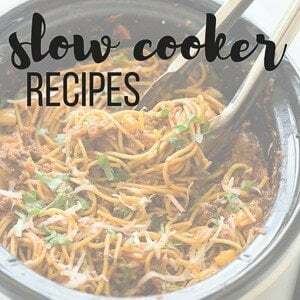 Way back in January, I decided to dust off my Instant Pot and give it a real shot at making me a fan. I’d had it for about a year and only used it a couple of times! I wanted to find out if it really was something worthwhile. 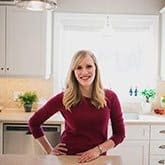 Since then, I’ve shared a few of my favorite Instant Pot recipes here on The Recipe Rebel, and I know you have been enjoying them just as much as I have! 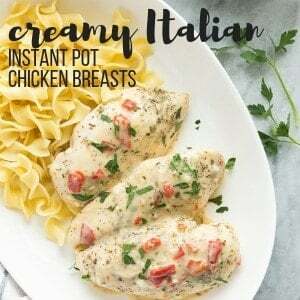 If you’re not quite ready to go for the whole chicken, check out my post on How to Cook Frozen Chicken Breasts in the Instant Pot. I’ll be totally honest: I’m not all that big on manhandling raw meat, which is why you’ll see recipes with lots of lean, boneless cuts of meat around here. I do love a good whole chicken, though, especially for a Sunday dinner or such, so I enlist the husband’s help to lather the garlic butter over this baby. Because I know I’m going to be peeling the skin off after cooking (I keep it on so the breasts are more moist! ), I don’t bother rubbing butter on the outside of the chicken. If you want to crisp the skin up after cooking, I recommend drizzling butter on the skin just before placing it under the broiler. Let’s be totally honest here: this is not a beauty contest roast chicken. It is moist, and flavourful, and easy, and those are all wins in my book. 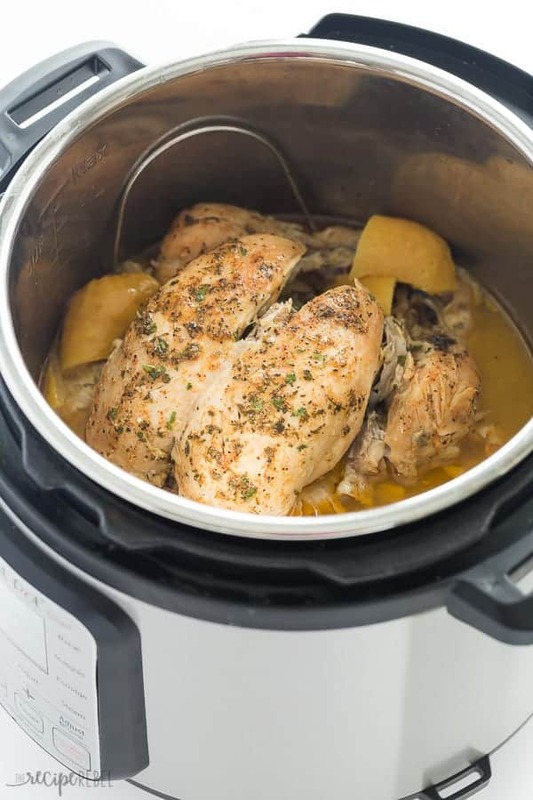 I would rather have a delicious whole chicken from my Instant Pot than a dry but perfectly golden chicken from the oven! 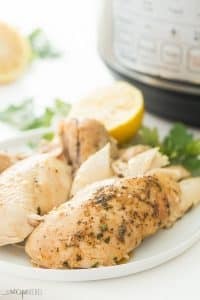 I love serving this pressure cooker whole chicken with a side of mashed or instant pot baked potatoes, and all the fixings. Gravy, veggies, and please tell me there is some sort of bread because bread = life. And what’s a Sunday dinner without it?? You can absolutely adjust the seasonings to suit your tastes on this one. Don’t like garlic? Leave it out. Want a little more spice? Throw in some cayenne (but, please, start slowly!). Want to add in fresh herbs from the garden? Perfect! I prefer to cook the chicken with the skin on, but it will not crisp up in the pressure cooker. If you like, you can brush with oil, transfer to the oven and broil until golden, or you can peel it off before cooking if you prefer. Keeping the skin on during the cook time helps to keep the moisture in. 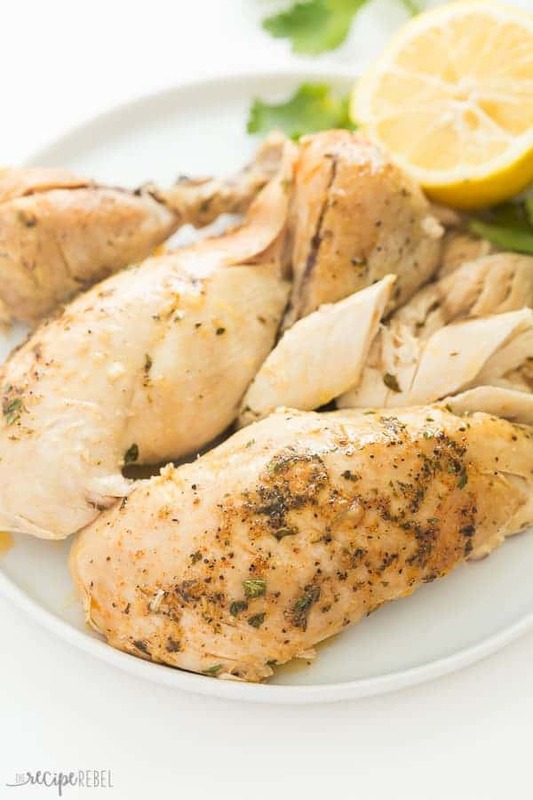 If you aren’t going for beauty, flip the chicken upside down so that the breasts will cook in the juices — this will give you the juiciest white chicken meat! If you are going for beauty, I recommend removing the breasts from the chicken, and serving it with remaining pieces on a large serving platter as pictured. It won’t hold up in one piece when you remove it (because the bottom pieces are so moist! ), but it will look great on a plate with some of the juices drizzled over. How do you cook a frozen chicken in the Instant Pot? I know that some people will say it doesn’t take any longer to cook frozen meat in the Instant Pot than fresh, but that hasn’t been my experience. I tested this recipe over and over again (6 times! ), from fresh and frozen, and it does require more time from frozen. The cook times I have found to be accurate are 8 minutes per pound fresh and 13 minutes per pound frozen. 12 minutes was close, but there were still undercooked spots. If you know you want to freeze the chicken, I recommend seasoning, removing any giblets from the chicken and tying the legs (mostly for beauty — not necessary!) before freezing, so that you can toss the chicken into the Instant Pot without worrying about any of that. Unwrap your chicken and remove any bag from the inner cavity if there is one. Gently loosen the skin but do not remove it. In a small bowl, combine butter, parsley, seasoning salt, garlic powder, pepper, and paprika. Spread butter evenly under the skin of the chicken. *At this point, you can cook or freeze. To freeze, wrap in plastic wrap and place chicken in a large freezer bag. Freeze for up to 6 months. Follow cook times in recipe notes to cook from frozen, or thaw before cooking and follow remaining steps. Place the trivet in the Instant Pot and add chicken broth. Add chicken and place onion and lemon quarters around and under the chicken if desired (the lower pieces of chicken will absorb the lemon flavour, so don't use it if you don't want that). Put the lid on and set the valve to sealing. Set the Instant Pot to manual, high pressure (the default), and 32 minutes (or 8 minutes per pound of chicken). It will take about 15 minutes to come to pressure and begin counting down. When it is done cooking, turn the Instant Pot off and let pressure release naturally for 5-10 minutes before moving the valve to venting and releasing remaining pressure. Open the lid and insert a meat thermometer into 3 or 4 places where the meat is the thickest. Be sure that it reaches 165 degrees F in all places. Peel the skin off the chicken (or move to a broiler to brown if desired). Serve. Hi Ashley. I was wondering; can you put vegetables in when cooking the chicken? For instance, potatoes? You could, but they will be really soft by the time the chicken is cooked. I would probably rather cook them in the oven or on the stove for this reason. When I cook baby potatoes or carrots, I give them 2-3 minutes in the Instant Pot and they are perfect. Hi first time trying a whole chicken my instant pot is a 8qt duo I dont have a manual button what other button should I use? I have poultry? Pressure cook and manual are the same thing, just different models! Thank you for sharing this recipe! If I were to crisp the skin under the broiler as you suggested, would the chicken lose it’s moisture and become dried out? It won’t become dried out unless you really broil it for quite a while. It should be fine for a few minutes! Thank you for sharing. I had frozen chicken before I had an instant pot so I’m wondering if you have a suggestion as to how to cook a frozen chicken the gizzard and things haven’t been remove from before freezing. If they are in a parchment bag then you can actually cook it with them inside, then remove after! I think that most of them are okay to cook with it inside, but it’s difficult to be sure when it’s one big frozen lump, I know. I have heard of some people running luke warm water over just to get the bag out and then cooking. If the whole chicken is frozen, how do you get the butter under the skin? You would have to do the butter before freezing. I do that if I know I want to cook them from frozen! What do you do if the chicken isn’t done? Can you pressure cook it a little bit more? You can definitely turn it back on for 5-10 minutes if you find it hasn’t reached 165 F.
Good morning , I have the Farberware pressure cooker, I have not tried cooking anything frozen as yet, it does not mention or suggest it. I assume it would work the same as the Instantpot could you please give me some feedback on this ? Hi Sally! Unfortunately I only have experience with the Instant Pot. If it is also an electric pressure cooker then I would think it should work the same. I would love to hear how it turns out if you try it! Just love how juicy this chicken is! Thanks for testing it so many times to make a really reliable recipe. This is my favorite way to cook chicken now! 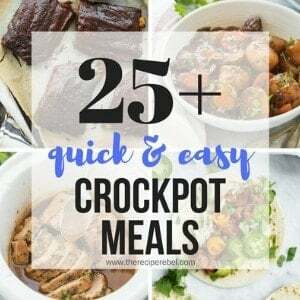 I love my Instant Pot!